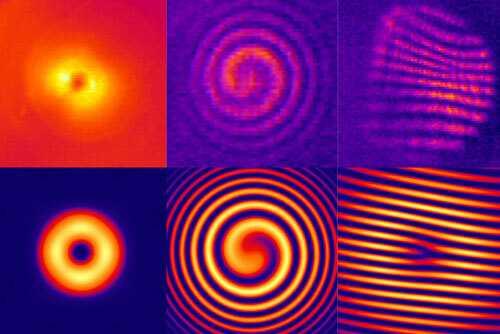 (Nanowerk News) Exploiting a novel technique called phase discontinuity, researchers at the Harvard School of Engineering and Applied Sciences (SEAS) have induced light rays to behave in a way that defies the centuries-old laws of reflection and refraction. The discovery, published Sept. 2 in the journal Science ("Light Propagation with Phase Discontinuities: Generalized Laws of Reflection and Refraction"), has led to a reformulation of the mathematical laws that predict the path of a ray of light bouncing off a surface or traveling from one medium into another — for example, from air into glass. "Using designer surfaces, we've created the effects of a fun-house mirror on a flat plane," said co-principal investigator Federico Capasso, Robert L. Wallace Professor of Applied Physics and Vinton Hayes Senior Research Fellow in Electrical Engineering at SEAS. "Our discovery carries optics into new territory and opens the door to exciting developments in photonics technology." 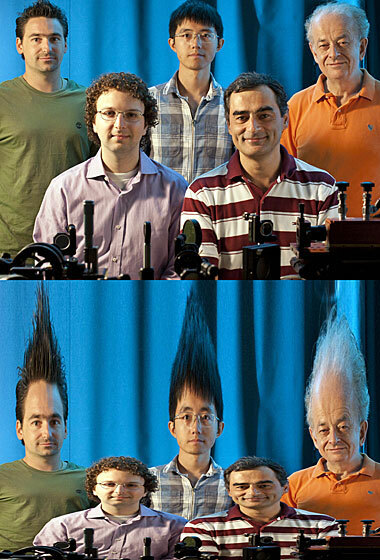 Team members in the top photo include Patrice Genevet (clockwise from left), Nanfang Yu, Federico Capasso, Zeno Gaburro, and Mikhail A. Kats. In the bottom portion of the photo, a simulation of the image that would appear in a large mirror patterned with the team's new phase mirror technology. It has been recognized since ancient times that light travels at different speeds through different media. Reflection and refraction occur whenever light encounters a material at an angle, because one side of the beam is able to race ahead of the other. As a result, the wave front changes direction. The new generalized laws, derived and experimentally demonstrated at Harvard, take into account the Capasso group's discovery that the boundary between two media, if specially patterned, can itself behave like a third medium. "Ordinarily, a surface like the surface of a pond is simply a geometric boundary between two media, air and water," said lead author Nanfang Yu, Ph.D. '09, a research associate in Capasso's lab at SEAS. "But now, in this special case, the boundary becomes an active interface that can bend the light by itself." The key component is an array of tiny gold antennas etched into the surface of the silicon used in Capasso's lab. The array is structured on a scale much thinner than the wavelength of the light hitting it. This means that, unlike in a conventional optical system, the engineered boundary between the air and the silicon imparts an abrupt phase shift — dubbed "phase discontinuity" — to the crests of the light wave crossing it. "By incorporating a gradient of phase discontinuities across the interface, the laws of reflection and refraction become designer laws, and a panoply of new phenomena appear," said Zeno Gaburro, a visiting scholar in Capasso's group who was co-principal investigator for this work. "The reflected beam can bounce backward instead of forward. You can create negative refraction. There is a new angle of total internal reflection."